Hey, everybody. I have a little bit of a fun topic to discuss today (though I don't think it counts as "creative corner" content). You all have seen amazing tattoos. All over the map there are amazing artists that use other people's bodies as canvases, and I've always wanted some sort of ink branded on my skin. Possibly the most amazing tattoo I've seen to this day belongs to my ex girlfriend, which is a giant drawing of the giving tree on her thigh that is a million shades of watercolor ink. So, my question for you all is this: Do you have any tattoos yourself? If so, post them down below! And, if you're like me and you don't have any yet, what are some of your ideas for tattoos that you want done? 1. A red rose with a banner wrapping around the stem that says "Love Yourself to No One Has to", a quote from the All Time Low song "Therapy". I thought this one up recently, and I think that it's a good idea for a personal tattoo that I won't regret in the future. 2. A flying sousaphone with fire coming out of the bell. Yes, it's stupid, but it's stupidly EPIC! As a tuba player, I need to show off some of my low brass pride, and what better way to do that than to get the most stupidly amazing sousaphone tattoo in existence?! I would like to get a tattoo of Sora's Necklace (The Crown part) on my Wrist. Mostly because I'm a Die Hard KH fan. I have six tattoos so far, if you count the two on my wrists seperately. I neither have tattoos nor do I plan to get any, but if I would have a tattoo, I figure I would take one of the Digimon crests, most probably sincerity or kindness. Digimon is such a big part of my life and I loved the representation of the crests in the series and the subtle design. Before I randomly decided one day that I didn't want to bother, I wanted to get chains on my wrists like Jack from Bioshock 1, the delta symbol (a triangle) on my right hand for Subject Delta in Bioshock 2, the Triforce on my left hand (Legend of Zelda), the heartless and nobody symbols on my upper arms, the unversed, dream eater and nightmare symbols implemented somewhere, and angel and devil wings on my back because of the Change of Heart card from Yu-Gi-Oh!. Is that why your name is Veevee? I also really love Digimon. I bought a tag and crest set off Ebay and I was so excited to have something like that. I don't want to go too far off topic, but have you seen Tri yet? I have eight. All on my arms. -Three smaller tattoos on the side of my forearm (one is a symbol represents sword of valor; derives from a country in West Africa, the African continent (red on top, black in the middle, and green on the bottom), and another one from a country in West Africa, a fern that represents endurance. I haven't decided what I wanted to get next. Though I plan on filling up my left arm some more before I start working on tying in a sleeve. I plan on getting it filled in whenever I'm more financially stable. - some sort of KH related symbol because... reasons. 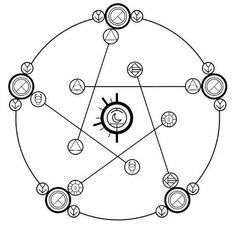 - Fullmetal Alchemist Reversal circle yk this one? Also I unapologetically like Therapy as a song but maybe get that typo fixed so it isn't tatted on your body forever right? I got my first tattoo this year in April. It's a shillouete of four flying birds on my ankle. That's my main plans at the moment. I'm open to others though. The Change of Heart card is also one of my favorites, I like that! I've got a cat tat on my ankle that I got in April, it's my first one. It's just the outline though. 1. A butterfly/dagger combo on my left wrist. 2. A bi colored bat on my right wrist (my sister Dream already mentioned this on in her post). 3. A rose tattoo on my shoulder, not sure which yet, with love written in cursive. 4. Stomach (surrounding my navel) for a book-bird tattoo. 5. I'm also thinking about get a couple of mental health tattoos on my ankle (opposite side of my cat tat) in August because I have panic disorder and depression, so I'm not sure which one I'd want. It'd either be one that says "I'm free from my anxiety and depression" or "I'm stronger than my demons". I just really like the idea as a reminder to myself when I'm having a rough day, especially since I'm doing an internship where I'm going to be by myself for several months and there's been times over the last few months that my anxiety was bad enough that all I could do was hide away in my room (despite wanting to go out and do things) hyperventilating.